I Hear Too: Live - A unique event showcasing sound-art and music in the historic setting of York Minster. Every year, the beautiful medieval church of York St Mary’s is home to specially commissioned art works that complement its distinctive space. The 2009 installation, the fifth to be commissioned, was Five Sisters. 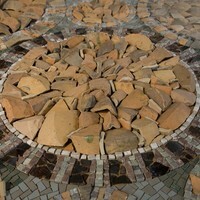 Five Sisters was created by the internationally renowned mosaicist Emma Biggs and her artist partner Matthew Collings. The piece, inspired by the great five light window in the Minster’s north transept, uses fragments of medieval pot from the Yorkshire Museum’s collection in a huge, floor length mosaic, which mirrors the nature and history of the window, and which is complemented by a series of oil paintings that also speak to the windows properties. Janet Barnes, CEO of the York Museums Trust, of which York St Mary’s is a part, realized that the making of this unique art work should be documented on film, and commissioned IPUP director Helen Weinstein to direct a documentary following the artists as they worked in their studio and in the exhibition space. The film was shown in York St Mary’s during the run of the installation, and a short version can also be viewed below. For more information see the York St Mary’s pages. You can also download a copy of the project report here.